The gasoline vapour recovery system VARECO VENT/ TSMF (Stage I and II) is a 2 stages compact system with active carbon and membrane technology. The system consists of three parts, namely the processing unit, the cooling and the control cabinet. The system is built as a module in a steel cabinet and can be extended with additional individual modules. It is prefabricated, preassembled and tested and can be easily placed on a foundation. VARECO VENT/ TSMF allows a recovery rate of up to 99% of the vaporized fuel and thus meets the requirements of 20 and 21 BImSchV (German Federal Pollution Control Act). The system can be used both at gas stations and on tanker terminals. VARECO VENT /TSMF works with the adsorption forces of the membranes. Adsorption means the process of accretion or concentration of a liquid or a gas on a solid surface. Because of the overpressure in the storage tank, the fuel vapour enriched air flows into the condensate trap. The vapour condense there mostly to liquid fuel. The remaining vapours flow together with the air through the membranes. The membranes absorb the fuel vapours like a sponge, so that only clean air comes out of the system. During the air purification process and under the influence of the negative pressure on the other side of the membranes the fuel vapours desorb. The required negative pressure is generated by the vacuum pump. The recovered product is collected in the condensate trap and carried back into the storage tank. For better emission values the air, passes out of the membrane module, is purified additionally by an activated carbon filter. The maximum capacity of the plant is 120 m³/h. The emission limit of the system is less than 35g hydrocarbon per m³. 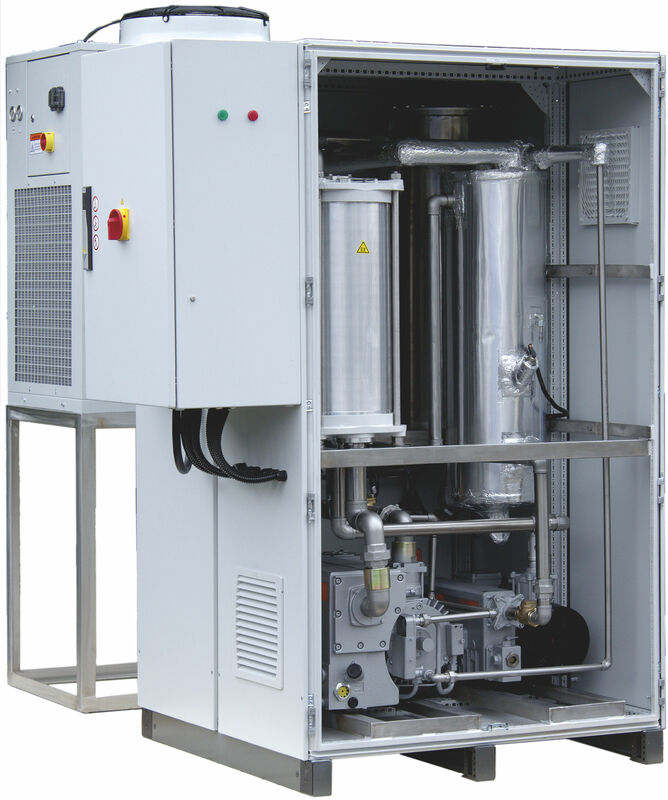 The process unit includes the whole process equipment like vacuum pumps, condensate trap, membrane module, magnetic valve, etc., and is designed to be installed inside hazardous areas (Ex-zones).